Summer time including June, July and August is the tourism season in Mongolia. June: Temperatures reach 20 (70 Fahrenheit), allowing for more comfortable travel conditions. The weather tends to be dry this month but an occasional rains bring relief to the parched grasslands. July: This is peak travel season. Weather is good although a heat wave usually hits around this time. Main feature is the traditional national Naadam Festival which takes place during the 11, 12, 13 July. August: In terms of weather, this tends to be the best month in Mongolia. Temperatures are pleasant and there is enough rainfall to keep the dust down and nature is really beautiful. At the beginning of this month berries start growing. September: This is the most beautiful time in Mongolia and everything is in its abundant. Nature is in yellow color and weather is not so hot and not cold too. It is appropriate to travel at the beginning of September. February: Mongolian winter is very cold and there is a plethora of snow everywhere. But late February and beginning of March, is time for Ice festival and camel festival it's the best time for the winter tour before it gets truely cold. Mongolian weather is rather cool and windy. In summer sometimes it's rainy. Therefore you should bring proper items with you including warm jacket, pants, hiking boots, thick sleeping bags, sunglasses, sun cream, insect protecting cream. You should not talk to strangers especially drunk men. In Ulaanbaatar city, when you are going in public and crowded markets and streets, you should be careful from pickpocket. If you are planning to ride horses, you should aware of this animal and be careful. Stay away from the dogs when you visit nomadic families. You should bring your small first aid kit with you. When tourists come to Ulaanbaatar city, Capital city of Mongolia, they will stay in hotel. When travel starts, they will stay in ger camps or tents depending on their interests or both of them. Ger is Mongolian traditional accommodation appropriate with nomadic lifestyle and easy to move and carry on cows and horses. Summer gers are thinner than winter gers. It has good exchange of air flow effecting in good health. In summer it is warm enough no need to burn fire. In Khuvsgul lake areas, it is little bit colder than southern areas of Mongolia. So it is better to burn fires in stove, You will feel totally different from staying in apartment. 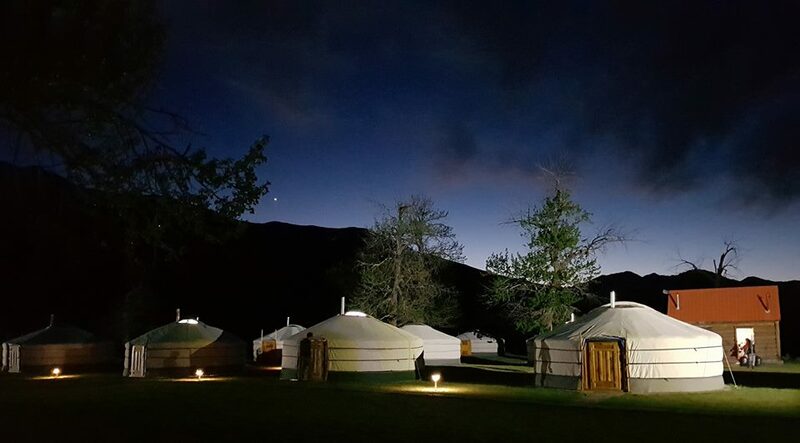 Ger is natural friendly accommodation of Mongolia.